Our Bucharest downtown accommodation options are the best way any visitor can make the most of his trip to Romania’s Capital, a city with a dynamic life style, where culture meets a vibrant nightlife and where classic architecture fuses with a never-ending quest for a modern metropolis. While 4 or 5 star hotels are all around the city, nothing beats the comfort and glamour of staying in any of our luxury Universitate Square apartments. This is what locals call the “0 kilometer”, the absolute center of the city. One could only imagine the unreasonable prices for a 5 star room near this location. 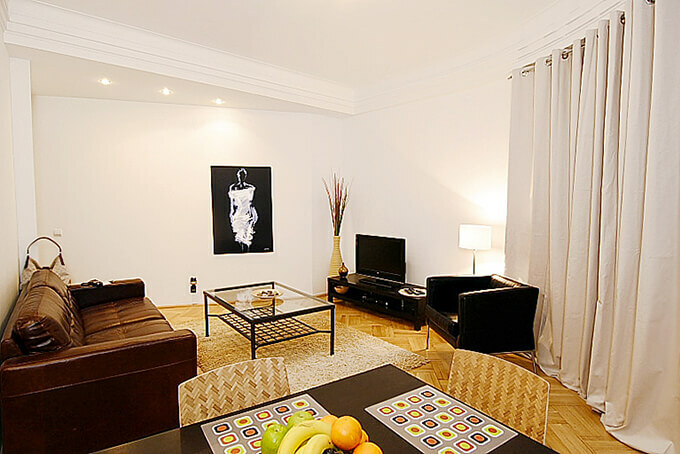 Whether you’re interested to rent apartment in Bucharest short term or for a longer visit, we can assure you that there is no better way to experience the city life and culture than renting your very own Bucharest downtown accommodation, at a much lower cost, without sacrificing none of the comfort or luxury. All our Bucharest downtown accommodation have a modern design, set up by professionals, so no space is wasted and guests can make the most of their staying. 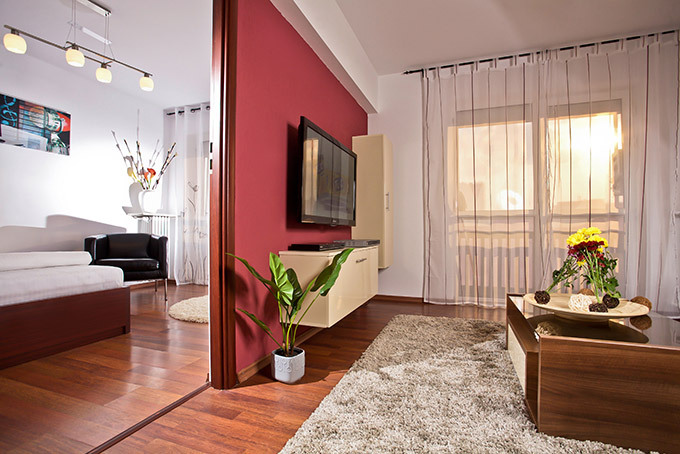 Every rent apartment in Bucharest short term benefits from a fully equipped kitchen, a high speed Wi-Fi Internet connection, Air Conditioning and huge large screen TV for entertainment for an extra touch of satisfaction, especially if you’re travelling with your family or friends. The Cismigiu Garden, Bucharest’s oldest park, is just a couple of minutes away and so is the Old City, packed full of pubs, cafes and clubs, the absolute zenith of the city’s nightlife. The best art galleries and museums are waiting, it’s only up to you to make time for all. If you prefer other areas but still be close by to all attractions you should check out our Unirii Square apartments for rent, our City Center short term rentals or our accommodation in the center of Bucharest. Whether you’re traveling alone or with a group, our Bucharest downtown accommodation facilities will provide you with all privacy and comfort you need, in a very relaxed environment, making you feel like you never left home in the first place. We kindly invite you to discover as much as you can from what Romania’s Capital has to offer, while enjoying your stay at our Universitate Square apartments!